NEXTSTEP and OPENSTEP came with a number of bundled resource apps that were designed to add to the functionality of the system. Three of these revolved around searches of a user's system, and are the subject of this article. 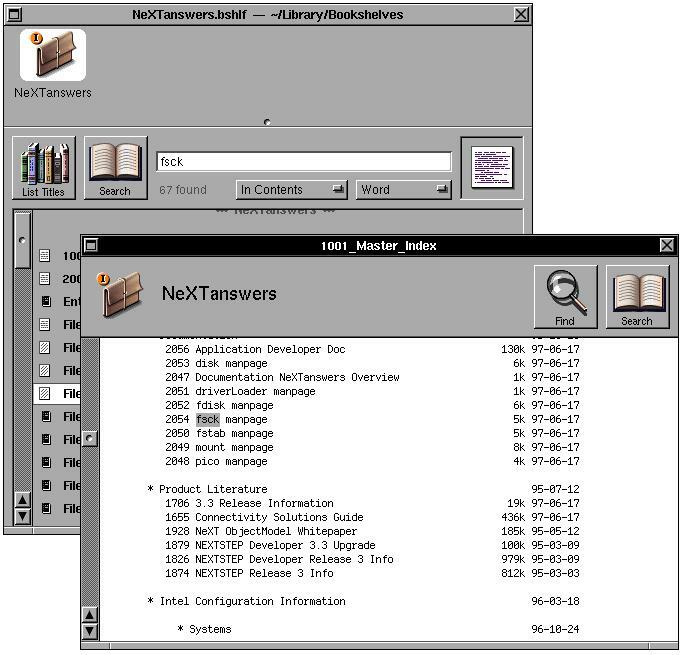 One of the most advanced features of NEXTSTEP/OPENSTEP is the Digital Librarian. It introduced indexed searches, content search and saved searches back when these abilities were only for enterprise scale systems. And it provided these abilities with a very user friendly interface. 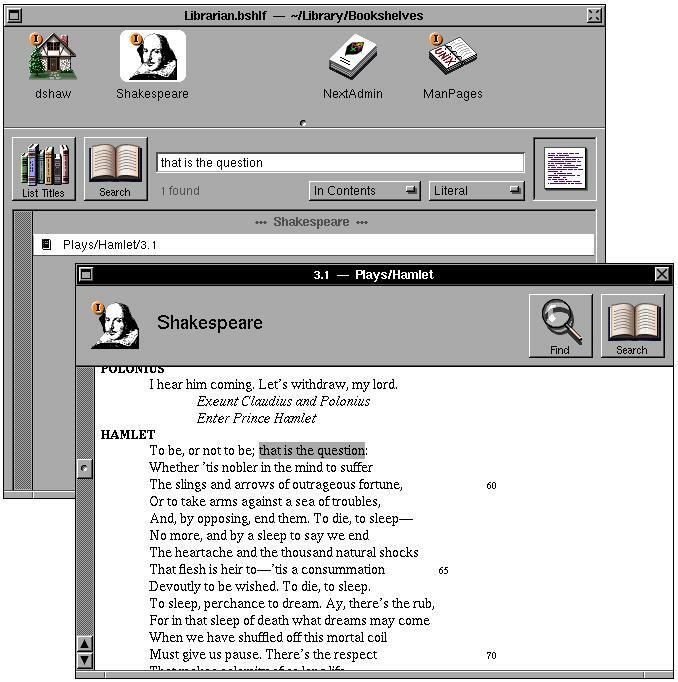 NEXTSTEP originally came with the complete works of Shakespeare, and was set up as demonstration of how the Librarian could be used to find content. NeXT stopped bundling Shakespeare with their operating system after NEXTSTEP 3.3, but I have it installed on my OPENSTEP 4.2 system which is where the following screen shot comes from. The Librarian can be set to index a folder (and its subfolders) and then saved as a bookshelf. 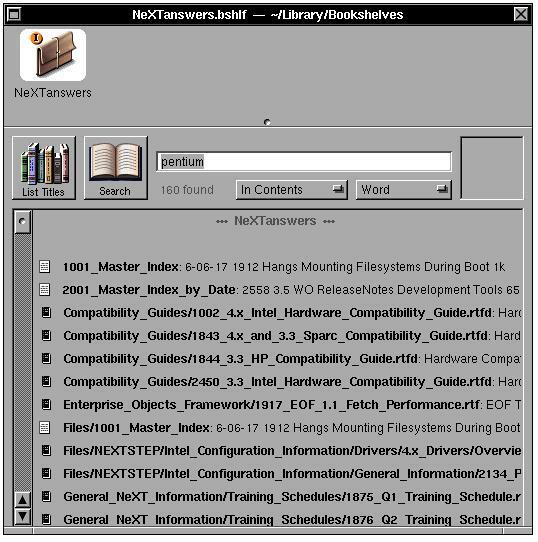 There are a number of preexisting bookshelves on any NEXTSTEP/OPENSTEP system which can be found in /NextLibrary/Bookshelves. In the shot below I've indexed my directory of NeXTanswers so that I can have quick access to answers when I run across issues on my NeXT system (or when people ask questions). And as with the Shakespeare results, Librarian can display many of the document within the application itself. When it comes to content searches, Librarian is set up to search within any of the native file formats of a NeXT system (Rich Text, Plain Text and Postscript). It can also be extended to search in documents of other applications if they include a parsing agent. The method for finding and activating these is covered here (NeXTanswer 1114). The Librarian's inspector provides the ability to index, update an index and even schedule index updates of any of the folders you've created indexes for. 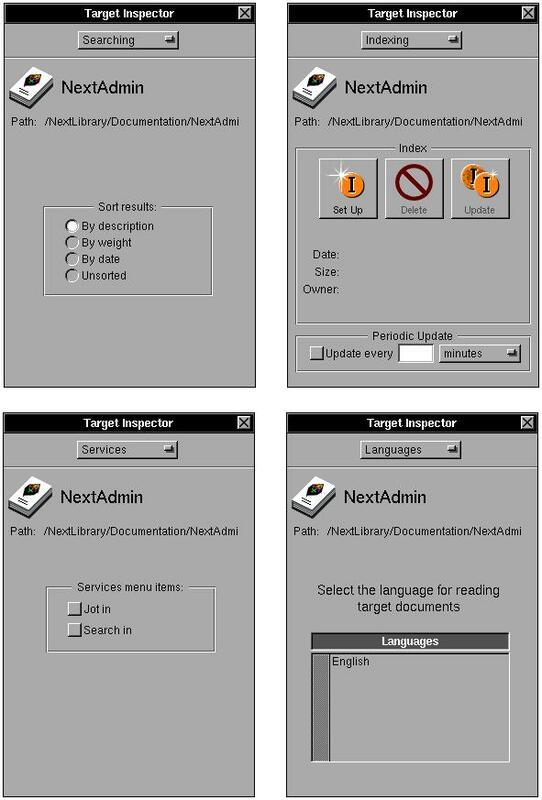 Below is the four views of the inspector, with the second view being the indexing controls mentioned above. 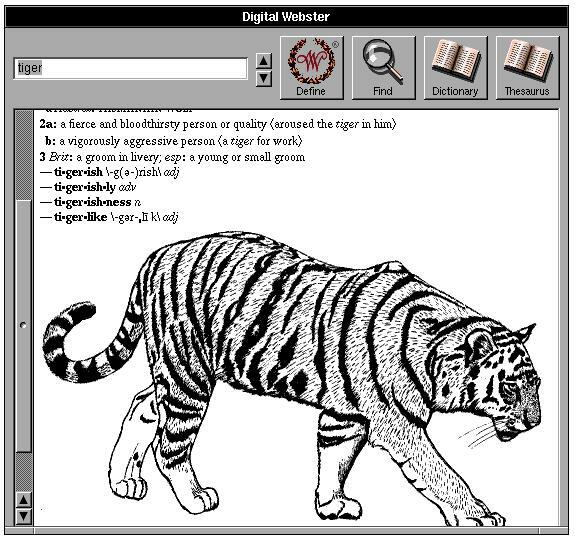 NEXTSTEP and OPENSTEP also come with a bundled dictionary/thesaurus application called Digital Webster. It is a service based application that can be accessed from just about any app via the services menu or a keyboard command. The following image is an example of search result for the word "tiger". It should be noted that images are optional and some people opt not to install the Webster images during the installation of NEXTSTEP/OPENSTEP if they are installing on a small disk. The images can still be added later by installing the Webster images package on the original installation CD. 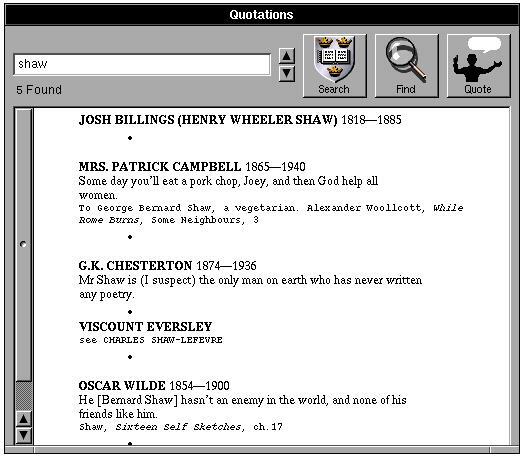 Like the Shakespeare collection, the Quotations app and it's data wasn't included on later versions of NEXTSTEP/OPENSTEP. The shot of Quotations below was taken on my OPENSTEP 4.2 system, but the application itself and it's data came from my NEXTSTEP 3.1 installation CD. All of these search abilities were originally added to NeXT's operating system to provide functionality NeXT thought that their users would need. As NeXT changed it's focus from education users to business/enterprise users, the bundles reflected the needs of the target audience (which was most likely why the Quotations and Shakespeare collection were dropped over time). Oddly, even though both Webster and Librarian were very popular, they were dropped by Apple in Rhapsody and Mac OS X. Third party developers attempted to fill the need for these apps with applications like OmniDictionary (Rhapsody, Mac OS X), OmniLibrarian (Rhapsody), MTLibrarian (Rhapsody, Mac OS X) and Nisus Thesaurus (Mac OS X). Apple did return much of the functionality Librarian and Webster in Mac OS X v10.4 with Spotlight and Dictionary (I believe that OmniLibrarian and Nisus Thesaurus have actually improved on the original Webster model while Dictionary seem to only picked up where Webster left off, as OmniDictionary and Nisus Thesaurus are free, I still highly recommend them even on 10.4 systems).